Here we are – Paula’s Birthday Time! I would not be surprised to hear my brain tell me “Mom!! – that’s enough reminders of birthdays!” But this mom has wonderful news to share, and there is no better time than the occasion of a remarkable woman’s birthday to show how Paula’s legacy is making a difference in the lives of young Afghan women. To date, three young women from Afghanistan have benefited from your generous support of the Paula Loyd Foundation. Narges, the first young lady we brought over from Kabul and who graduated from Choate last year, has just completed her first year at Muhlenberg College in Pennsylvania on a full scholarship from the Afghan Girls Financial Assistance group. The Foundation also has financially sponsored Homa, a young lady from Kandahar, in her studies at American University in Kabul. She will be graduating in the Spring with a major in Law. The Institute for the Economic Empowerment of Women has selected Homa for a leadership conference in Dallas this summer. Terry and I also plan to attend the conference and finally meet her in person after four years of email correspondence! Finally, we will continue to support Homa’s younger sister, Hosnia in her studies at the American University in Kabul. 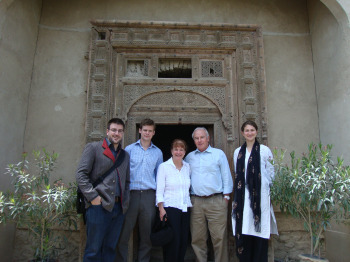 She has been greatly inspired by Homa’s desire to make a difference in Afghanistan. Without a doubt, Paula would have admired these three young ladies for their determination and commitment to becoming change-makers for their country. We are pleased to support them in this important educational journey. Our positive experiences with Homa and her sister Hosnia caused us to rethink the Foundation’s mission. We are thrilled to announce we will now apply our efforts almost exclusively toward finding and supporting Afghan girls attending the American University in Afghanistan. We decided to do this for several reasons: 1) it is more acceptable for some Afghan parents to let their daughters go to school in Afghanistan, rather than leaving the country; 2) the Foundation does not have the added expense of bringing them here and then sending the back home and bringing them back here; 3) they are networking in Afghanistan where they will be working; and 4), American University’s tuition and housing fees are lower than most colleges in the United States, and so, hopefully, we can work with more girls. In order to allow for Paula’s wishes regarding supporting Afghan girls at Wellesley College, we also will be available to assist with any Afghan students who enroll there in the coming years. Paula opened all of our eyes to some incredible ways to affect positive change in this world! We are so grateful for your ongoing financial support. Her work requires much of us in the way of time, money and planning. Her work has not gone unnoticed! A recent incident shows how highly Paula and her legacy are appreciated. One of her teachers at Choate passed away last year, and left a bequest to the Foundation because he thought so highly of her — even though it has been more than 25 years since she was in one of his classes! I think that is extremely impressive, considering all of the very talented and famous people who have attended that school, many of whom he taught.